Have you made your New Year’s resolution yet? If so, you join the 44% of Americans who say they will do so for 2014, according to a Marist poll conducted in December 2013 among 1,173 adults. This share is up slightly from the 40% who planned to make a resolution a year ago. What are Americans resolving to do? You might expect the perennial favorite “lose weight” to top the list, but according to Marist’s question with open-ended responses, this year Americans are more concerned about other self-perceived shortcomings: 12% of those who plan to make a resolution say they want to spend less money or save more; 12% want to be a better person; and 12% want to exercise more. About the same share (11%) of Americans say they resolve to lose weight. The other most popular resolutions are also health-oriented: 8% of those making resolutions plan to quit smoking, eat better or take other steps to improve their health. 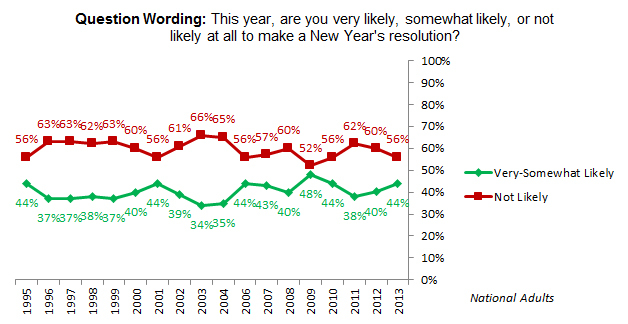 Among those who had a New Year’s resolution (and remember it), 72% said they kept it. If that holds up, we can all look forward to a trimmer, more financially sound, kinder American public in 2014 — and perhaps the need for fewer resolutions in the future.